Boeing 777x vs Airbus A350 – What Plane Is Best? Thanks to the enormous debate that came from our last topic, Boeing 787 vs Airbus A350, we have thought to put together a better comparison of the two aviation titans, the Boeing 777X vs Airbus A350! This topic is especially relevant as recently we have seen not one airline, but two airlines consider this very same choice. There are even rumors that Lufthansa is considering one or the other. Unlike the Boeing 787 Dreamliner, the Boeing 777X has not yet been delivered to any airlines. Comparatively, the Airbus A350 range has been extensively delivered and is currently in use throughout the world. This is because the Airbus A350 simply has time on their side, being designed, built and released to market years before the Boeing 777X series. For clarity, Boeing has two 777X types available for airlines, the 777-8 and the 777-9. Whilst Airbus has two A350’s, A350-900 and A350-1000. There was both an A350-800 and a 777-10 being considered, however, the former was dropped due to lack of demand and the latter is still a possibility. The A350-900 has been popular, fetching over 700 orders so far. What new technology does the Boeing 777X and Airbus A350 have? To achieve a lower gross weight, Boeing will incorporate carbon-fiber-reinforced polymer that was used with success on the 787 aircraft. 777-9X’s windows will also be 15% larger than competing airliners and placed at a height that will be eye level for most passengers (Source: Newsinflight). The aircraft is of 45% lightweight high-strength composite construction, and 55% low-density aluminum-lithium alloy, steel, aluminum and titanium. Airbus also claims that the A350 is 20% quieter than any other plane on the market. The cabin on board recycles the air every 2-3 minutes, allowing for a higher degree of humbity to avoid long dry flights. How will we be comparing the planes? To make this comparison fair, we will need to consider which of the four variants we will use in our test. We will be comparing the A350-1000 vs the 777X-9 as they are the biggest, most recent and most similar of the four. 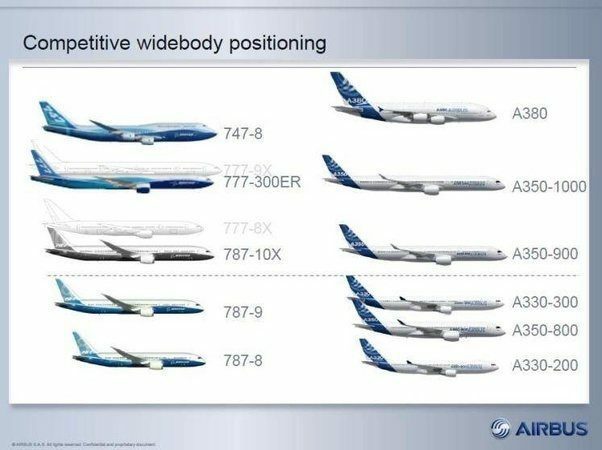 A comparison images based on capacity from Airbus. Note: This source might be biased. When deciding what factors make each plane better than the other, we will be coming from a point of view of an airline. As in, does it make business sense? One of the choices might have a cool feature such as LED mood lighting, but is it a factor that will lead to more profit? Otherwise, the feature will be ignored. Also, for my own sake, I’ll be calling the 777-9 the 777x throughout and the A350-1000 simply the A350. We will rank them on a variety of different attributes that can be found on the chart below. Without further ado, let us compare these two planes head to head. Seating: Despite being less than 10 feet longer than the Airbus A350, and only just over a foot wider, the Boeing 777X can fit nearly a 100 more people on board. This is because the Boeing 777X actually sits 10 passengers across in economy compared to the Boeing A350 at 9. However, we should point out that this victory might not be secure, as some Airbus A350-1000 clients have asked for Airbus to make their planes 10 seats across. Whether or not this is possible we have yet to find out. An additional argument could be made for 10 seats vs 9 seats. Would you be more comfortable on a 9-abreast Airbus A350 vs a 10-abreast Boeing? Unfortunately, airlines are not too worried about an extra person on each row and are happy to fit as many people on board as possible. Cargo Capacity: The Boeing 777X also schools the Airbus A350 with plenty more cargo space on board. Looks like we know who will win those lucrative mail contracts! Winner: Boeing 777X. That is a great question and one that is harder to answer. You see, both Boeing and Airbus claim that each plane is more efficient than the other. We know that the Boeing 787 Dreamliner is more efficient at smaller distances, but the A350-1000 beats it over long haul. But as for the Boeing 777x, that trend may continue. Turns out that the 777x is far heavier than the A350-1000, at 190t to 155t on the Airbus. This means far more fuel burned for the extra passengers and cargo. Airbus has claimed that a full A350 weighs less than an empty Boeing 777x. No matter how fuel efficient a plane may be, if their competitor weights far less then its already an uphill battle. So which plane is best? Again, its what you want to do with it. The Airbus A350 is perfect for high capacity, ultra long-haul routes (Just like the new route Singapore to New York), whilst the 777X is great for more popular shorter routes. Ultimately, these two aircraft are so close that it remains to be seen what is more popular in the long term. Will the savings from an A350 outway the high tech cost of the 777X? Or will airlines prefer the higher capacity of the 777X to ensure even higher economies of flight? Let us know what you think in the comments, what is your favorite? The key question, as the OEMs continue to one up each other, is whether an A350-1100 stretch will be built. The A350-1100 would be an all new technology aircraft competing with a highly modified but derivative model, and should have both lower aircraft mile costs and lower seat mile costs than the 777-9. A stretched A350 would also help to bridge the large gap in size between A350-1000 and A380-800. We believe the A350-1100 will become a competitive necessity for Airbus. With the A350-1000 due for EIS in 2017, and the 777-9X due in late 2019 or 2020, there is still time for Airbus to bring out an additional model in time to check the size advantage for Boeing. 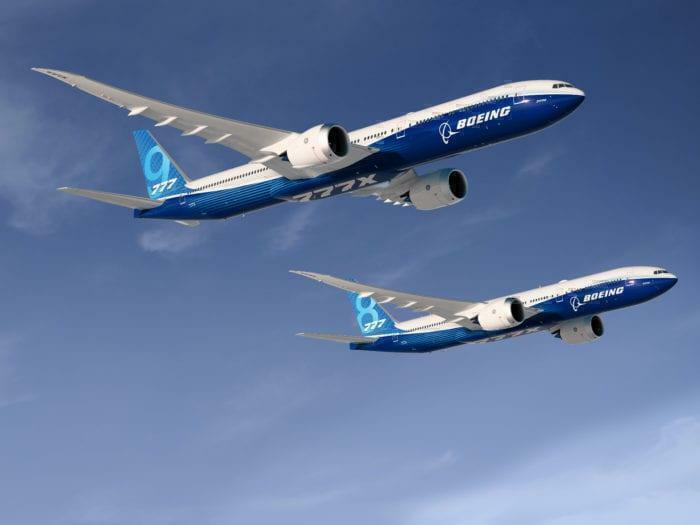 As airlines are looking to larger twins to replace 747-400 with aircraft of similar capacity, the time is right for these “super-twins” in the marketplace. The battle in the jumbo market could have an unexpected winner: The Boeing 777-9X. It all comes back to whether or not they could fill all those seats. Where exactly is the sweet spot in having plane too big that you can’t fill all the seats or too small that it’s less passenger efficient? The A380 is a perfect example of a plane too big and Boeing was correct in betting against the hub to hub versus direct flights that the B787 is capable of. One other advantage the 777x has over the A350 is while there may be more A350’s in service now, there are many more 777’s in service and carriers of that highly successful jumbo twin are more apt to choose a plane they are more familiar with and with a long term proven reliability track. The 777 was one of the most successful reliable jumbo jets ever built and the 777x is an improvement on that, with modifications such as the longer wings that allow for improved fuel mileage but with the forsight to make them folding so that the aircraft can be used in any current airport that flies the 777 without any infrastructure changes- a problem that has plagued the A380. Let Boeing build it first and the market Will judge who is the winner. Boeing has not proven their hypothesis yet. Thus there is no point of comparing Airbus 350 with a paper plane of Boeing. Having more aircraft size at the thinner end of the market means a “winner takes all” outcome. Since the A350 has a leg up on orders, time, and price. The 777X must establish a new market segment for which the A50 is not suited optimally. Optimization and market need is driving the Boeing offering. If you can fill a 777-9 it is a better aircraft than the A350-1000 because it’ll cost you less per passenger. But if you can’t, then the A350 is a better plane. Nothing costs more than empty seats! 1. In a like-for-like, apples-to-apples comparison the seat bottom width on the 777X at 10-abreast is 17,4 inches (i.e. 2 -inch wide armrests (2 x 13) and 17-inch wide aisles (2 x 17) – leading to an effective cabin width of 234 inches = 5.94 m). On the A350-1000 at 9 abreast the seat width is 18 inches (i.e. 2-inch wide armrests (2 x 12) and 17-inch wide aisles (2 x 17) – leading to an effective cabin width of 220 inches = 5.59 m). 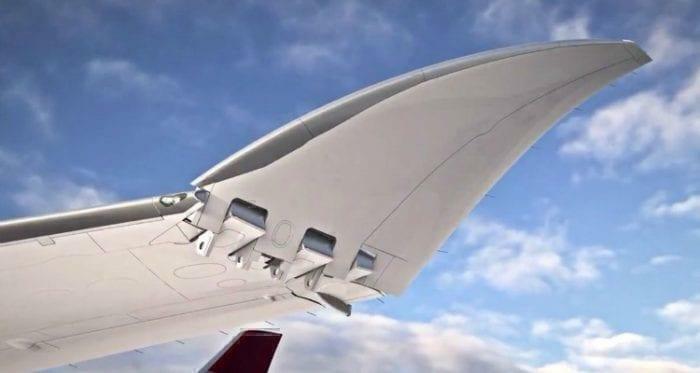 Hence, this wider outer section of the wing would facilitate two 777X-sized downward folding wingtips — extending effective wingspan to nearly 72m. Such an undertaking would increase the aspect ratio of the wing of the A350-1000 by upwards of 20 percent. One should not that the aspect ratio of the A350-1000 wing is lower than the aspect ratio of the A350-900 wing — due to the trailing edge extensions on the former which increase the wing area by some 4 percent, while the span remains unchanged (i.e. leading to a poorer wing aspect ratio. 3. A wing aspect ratio increase of some 20 percent would decrease induced drag by a similar amount. Of course, the modified wing would be heavier than the current one(s), but it would lead to a decrease in fuel consumption by at least 5 percent on the 316 metric tonnes MTOW A350-1000 version — something that would be extremely valuable on an A350-1000ULR (i.e. project Sunrise). In fact, such an enhanced A350-1000 would mean that the 777-8 would be DOA. 4. A decrease in induced drag in the order of 20 percent would facilitate a significant increase in MTOW (i.e 330+ metric tonnes) and a decrease in the maximum take-off thrust requirements. Hence, a 9-frame (5.72 m / 225-inch) stretched A350-1000 — having a MTOW of around 330 metric tonnes — would only require 97,000 lbs of thrust (x2) at take-off; or about the same take-off thrust as that of the current 308 metric tonnes MTOW version of the A350-1000. 5. A 79m long A350-2000, stretched by 225 inches, would have a slightly larger cabin than the 777-9 cabin. Since the slightly wider cabin of the 777X offesr little, or no advantage in the premium classes — with respect to how many seats that can be installed — a two, three or four class A350-2000 would have a larger carrying capacity than the 777-9. 6. A 79m long, 72m wide (wingspan) A350-2000 would also have a significantly lower Operating Weight Empty (OWE). With a MTOW of 330 metric tonnes and and taking-off and cruising with the two existing Trent XWB-97 engines, both the block fuel burn and fuel burn per seat would be significantly lower than those of the 777-9. Note the 3 big Middle eastern carriers have placed orders for the 777-x. This may not materialize if the big 3 american carriers start complaining about unfair trade practices such as government subsidies etc. or if the ME3 fail or lose market share. The US 3 have beeen complaing about the ME3 for years. However, with no success. Currently the ME3 are earning less due to intense competition of Turkish AL and other carriers in Asia and Africa. Hence a reduction in B777 orders is quite possible. I tend to like to look at who the airlines are ordering as they are the ones who are the true judges and look at maintenance, true price (not list), etc. In looking at the two families of aircraft in total and not just judging by one model, you can see that the 777 and A350 families are about even for this year in orders, Boeing came out ahead last year by a slim margin, Airbus the year before, and the two years before that were all Boeing. Probably the most disconcerting is that since the A350 has started being delivered (2014, so looking at 2015-2018), it has had a bit over a hundred orders added, while over the same period, Boeing has over 150 777s added, not to mention almost 400 787s. Dwight Looi gives all type of modifications to make Airbus the winner, so I think they need to start putting some of that into practice in get more numbers in the win column. Heads up that this needs correcting. Add empty weight to the comparison & shiver..